elLachlano had the most liked content! Watching this keenly. Please report back your process. I reckon a cheap 1/2 batch setup would go nicely further down the track. I've followed a few methods but I got lazy and worked out my own. I simply add a few litres of cooled boiled water to the yeast cake after bottling and then let it settle out for 30mins or so before pouring ~2L of the middle layer (you can usually see 3 at this stage of settling) into a sanitised container (usually one that held the initial boiled water. Boiling water = sanitised) to refrigerate for24hrs+. I then pour off most of the clear liquid and then shake up with what has settled to pour into a sanitised jar to label and keep in the fridge for next time. Good for 1 month at least. I've used older yeast than 1 month with great results. I think it's the overpitch. At harvest, I have much more viable yeast than I need for 1 batch so can deal with a few thousand/million cells deteriorate over time in the fridge. I've also read recommendations of not running batches over X amount of generations. Usually X = 7. I've never pushed this far with 1 strain. Ale kits for lagers and lager kits for ales. It's what I love about the craft. I made about 4 batches of the 1st borough Lager last winter (in Melb) using mostly ambient temps and a ski jacket for consistency around that time of year. I do have a temp control fridge but was doing ales in that with a heat belt. I thought "I've got 3 FV's and it's cold enough out here to try a leapfrog of ale/lager ferment." These always hovered around the 12C mark and the beer was great (hence the 4 batches). I'm hanging for the temps to drop so I can run this setup again. I ended up not worrying about the 18C starting temp (guided by Otto and the forum) as I went and just pitched as cold as I could get it on the mix. I was also harvesting the W34/70 yeast from older batches and could easily overpitch. I would highly recommmend reusing the yeast on this recipe as it only got better. Just make sure you keep the hops out of it. On the topic of hops, have a play around with them if you do more batches, as I reckon it's a great base to experiment with. The last one I did in winter still used the Hallertau Mittelfrueh on boil but I dry hopped with Topaz and Galaxy. It was devine! In fact, I've just put a long-neck of this in the freezer to chill. You've inspired me. This week marks 12 months in my 2nd stint at brewing. I got back into brewing beer at home after starting a few batches of Kombucha and it sparked memories of my first stint making cheap K&K hooch back in the early 2000's in my sharehouse kitchens while at Uni. Fast forward a few more sharehouses, a wedding and some kids. I'm now at a point where I've got the time to revisit all the hobbies I had before the kids came along. Next is to get back into pressing, shaping and painting skateboards... But that's a story for a different forum. I've brewed 28 batches in the past 12 months and learned a hell of a lot more than I ever did last time - mostly around hop additions, yeasts, temp control and mashing (so, you know, everything...). 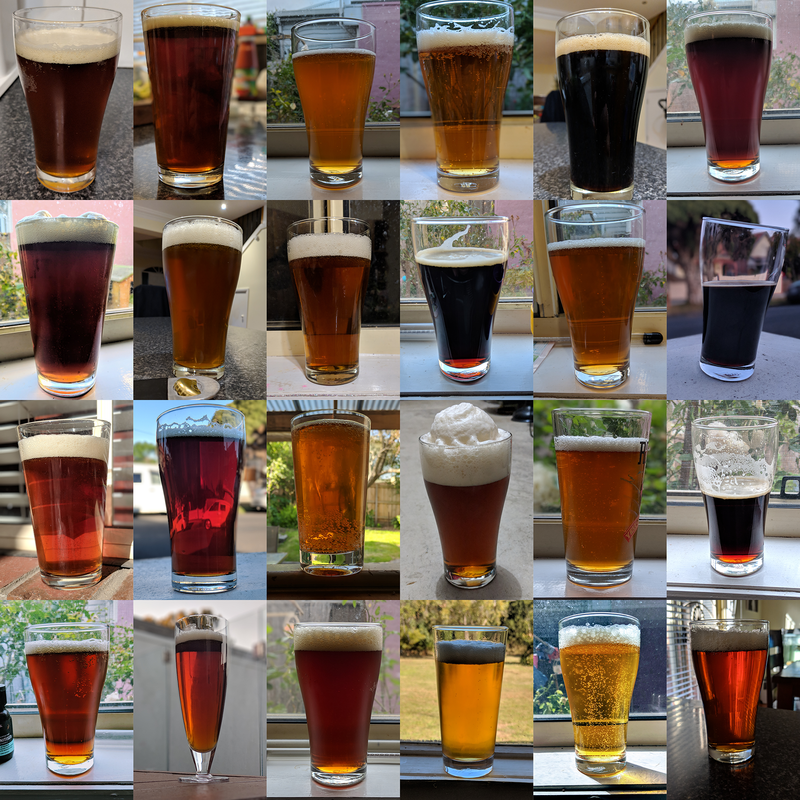 Some of the styles I've visited are: Pale Ale Amber Ale Red Ale Vintage Ale XPA Belgium Abbey Ale American IPA Australian IPA Scottish IPA Bohemian Pilsner Black Pilsner American Lagers Caribbean Porter Coconut Porter Hefeweizen These are mostly kits and bits / partial mashes. I headed right into hop additions from the start as I had some basic knowledge from the old days. I have equal love for complex and simplistic recpies. I do get a kick out of how some really basic ingredients/processes can still make a great beer. I keep a pretty tight google sheet around my brews which also tracks my costs against buying cheap commercial beer based on volume as a justification for buying more gear (currently up $1.5k). It has also helped in the recreation of a few cracking beers with good success. In the next 12 months I'm probably going to purchase a 40L Urn (got a mate in wholesale kitchen supplies) and try my hand a AG BIAB - wary of the time sink that this will be, but there's a few good points on this thread around maximising the timings around other odd jobs. Big ups to this forum for helping me along this journey. I'm always amazed at the amount of friendly advice that is given out so eagerly on here. Nice work. I'm about 4 brews away from trying this one so good to see some results beforehand. Might water it down a little though. Go 24L and hope for just above 5% abv. Got a plain ol' Hefeweizen in the FV. Cold weather set in this weeked and the temp control fridge started beeping this morning to say the temp had dropped below my ideal. Rigged the heating belt and got it back up to 19. Was going to keep this one plain as it's my first attempt, but getting my hands on some lemon myrtle this week and may drop that in to give it some kick as a Lemon zest weizen. I've never had a bottle bomb with beer before... ...but this is why I keep my kombucha bottles in a plastic tub in the pantry. Second one in 12 months. It's just so hard to predict. +1 to keep it. I remember this brew having some weird floaties/bubble formations (not that I dumped rubber ring in it). It looks just like mine did. I reckon you're golden. I cracked one of these I bottled in September this week. Soooo good. Just bought the ingredients for all these today: Pavlova Pale Ale Lemon Zest Weizen Hefeweizen Raspberry Blonde K9 Quencher I also want to put a Caribbean Porter in there to age just a little for winter. After a few months lightly brewing it'll be good to get back into it hammer and tongs. Need some more longnecks though as I've go a lot ageing at the moment. To the above ^^^ Does anyone have any suggestions to a partial grain type to add to this?? I have only ever done partials (by recipe) so my knowledge of grain bills is limited. I'm thinking just some normal ol 2-row / pils even... Let me know if I'm way off the mark. Big ups to all who have weighed in. I like a lively debate. I suppose the damage that alcohol does to the wider community can justify the taxes imposed, somewhat. I just don't trust the Australian Government to spend the revenue wisely to counter the fact. Craft and microbreweries surely suffer and so does the consumer. For now, in order to have the tastiest beers at the most reasonable prices it's homebrewing for me, with the occasional splurge on a night out or bottle of something a little stronger. Hey guys apologies to mods if this is a breach but I found an interesting discussion over on another platform that I'd thought I'd share and see if I can get some takes from the folks over here. Cos I value your opinions. I for one agree with this being a catalyst for reigniting my homebrew interest last year. $60 per carton for borderline megaswill is ridiculous. No regrets at all and I can now brew great beer that I can share with friends and family. How does everyone else feel about this?